NASHUA, N.H., August 19, 2014 – DataGravity today announced the launch of the DataGravity Discovery Series, the first ever data-aware storage platform that tracks data access and analyzes data as it is stored to provide greater visibility, insight and value from a company’s information assets. The DataGravity Discovery Series delivers storage, protection, data governance, search and discovery powered by an enterprise-grade hardware platform and patent-pending software architecture, enabling midmarket companies to glean new insights and make better business decisions. As more than 80 percent of the data being produced today is unstructured, companies are struggling to maintain, much less benefit from, their rapidly growing stores of human-generated data. Companies are paying a premium for storage infrastructure, layered management applications and siloed processes that only introduce greater complexities without offering real-time insights. DataGravity is addressing this challenge with the Discovery Series, a unified storage platform that offers insights at the same richness of intelligence, regardless of whether the data is block or file. It supports NFS, CIFS/SMB and iSCSI LUNs, with the additional capability to manage virtual machines natively. The DataGravity solution delivers these all-inclusive features at a price competitive with other primary storage solutions, with an MSRP between $50,000 and $100,000. The DataGravity Discovery series will initially be offered in two models, the DG2200 and DG2400, with 48TB and 96TB capacity levels respectively. 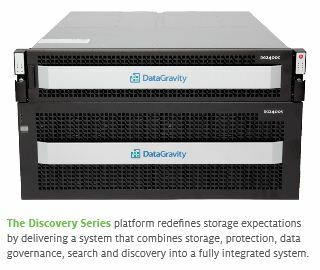 The Discovery Series will be exclusively sold through the DataGravity Partner Network of resellers.